Once more, German side SC Magdeburg are the only former winners of the EHF Champions League in the upcoming EHF Cup Group Phase. Furthermore, they have won the EHF Cup three times when it was still played in its old format – the last victory came exactly ten years ago and in the 2016/17 season they hope to reach the EHF Cup Finals for the first time. 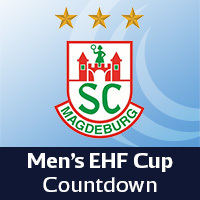 SC Magdeburg’s best results to date in the new format are the quarter-finals in 2013 and 2016, but on both occasions they were eliminated by eventual winners Rhein-Neckar Löwen and Frisch Auf Göppingen respectively. In this season’s Qualification Round 3, Croatian domestic championship runners-up RK Nexe were not a too high hurdle to clear and in Group C SC Magdeburg now face KIF Kolding Kobenhavn, Grundfos Tatabanya KC and Maccabi CASTRO Tel Aviv. On a side note, Wiegert’s father Ingolf coached SC Magdeburg in the early 1990s while his son Bennet played for the club. Overall, there are plenty of teams in Wiegert’s opinion who can make it to the EHF Cup Finals in May. Ahead of the season, Magdeburg signed Norwegian Christian O´Sullivan, Danish Olympic champion Mads Christiansen and Swede Daniel Pettersson. On the other hand, experienced stars such as Michael Haaß, Andreas Rojewski and Jens Schöngarth left the German club. “For us the participation in the group phase is the result of a successful season 2015/16 which was crowned by winning the German cup. For me is it a great experience and reaching the group phase is something special,” says Wiegert.